Interceptive orthodontics is the practice of extracting the deciduous dentition in an attempt to avoid an adult malocclusion. That’s pretty technical. Here’s what that really means ….if the area for the teeth to grow is smaller than required for a full normal set of teeth, we simply put in a brace to slowly expand the mouth so all the teeth will fit. 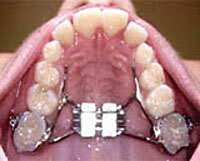 If this correction isn’t made the teeth will be out of place, often with one tooth behind another one. If correction is needed it needs start around age 6 – 11 years of age to take advantage of growth at that time. Waiting longer can cause the extraction of permanent teeth. Call us soon for your child’s evaluation.